Happy Birthday to Michael Landon on what would have been his 76th Birthday. He is missed so much. Happy Birthday Michael Landon! Alison Arngrim posted this in her FB in honor of Michael's Birthday and Halloween. The following are clips from Michael in "I Was a Teenage Werewolf." Happy Birthday, Michael. We'll never forget all you gave us! We are sorely missed, but I know you're much better now! He would have been 76...wow! Happy belated Birthday, Michael Landon! I loved the article and I saw another face of our old friend Michael Landon very well depicted by his friend Kent McCray. Mike was a very nice guy who was fond of practical jokes and who could be a very faithful friend...But sometimes, he was not an easy person to go along . However, McCray article shows that Mike was a guy who loved his job and wanted to learn more and more about it. It was specially interesting the part in which Kent tells the way Michael learned how to direct. 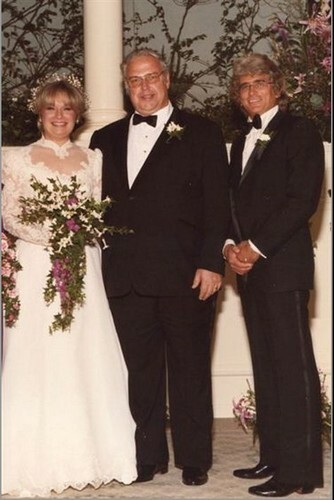 Great picture of Susan, Kent and Michael. Thank you for sharing it. Happy "78th" Birthday and Happy Halloween to Michael up in Heaven. Happy birthday, Michael. Thank you for all you did to bring prairie fans together. Happy "80th" Birthday to Michael up in Heaven. Hard to believe he would have been 80. Just imagine what he could have accomplished if he had lived longer. Happy birthday, Michael. We miss you. Subject: Re: Happy Birthday Michael Landon!